The Station's conservation mission is to protect, maintain, and monitor the ecological integrity of the Station's habitats and species. Proper stewardship of the Station's natural resources are also integral to many of the legal obligations that the Station is responsible for maintaining. UF maintains a conservation easement with The Nature Conservancy on most of the land that comprise the field station. A conservation easement is a voluntary, legally binding agreement between a landowner and a qualified land trust or government entity that permanently limits uses of the land in order to protect ecological, historic, or other scenic resources. UF’s easement agreement is designed to protect the natural resources of the Station and at the same time integrate research, teaching, and extension activities. 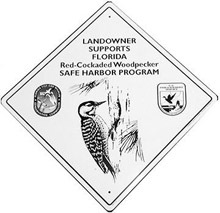 UF established a Safe Harbor Agreement (SHA) with the US Fish & Wildlife Service for Red-cockaded woodpeckers (RCWs) at OSBS in 2009. Red-cockaded woodpeckers are protected under the federal Endangered Species Act, meaning landowners have a legal obligation to protect the birds and their habitat. A Safe Harbor Agreement is a voluntary agreement involving private or other non-Federal property owners whose actions contribute to the recovery of species listed Safe Harbor Program Signage as threatened or endangered under the Endangered Species Act (ESA). In exchange for actions that contribute to the recovery of listed species on non-Federal lands, participating property owners receive formal assurances from the Service that if they fulfill the conditions of the SHA, the Service will not require any additional or different management activities by the participants without their consent. In addition, at the end of the agreement period, participants may return the enrolled property to the baseline conditions that existed at the beginning of the SHA.